Several people have asked me if I was again going to make predictions this election, like I did last election. I have been somewhat reluctant, mostly because I have not been as involved this year. This is largely because I have decided to continue my schooling. But, as I walked into city hall to vote today (a mistake, since voting at BC city hall doesn't start until tomorrow) I decided I would go ahead and make my predictions public. To start, I want to say that I am very impressed with who we have running this year. I don't know all the candidates but all those I know, care about the city and would all do a decent job. I think no matter the outcome, the city will be in good hands. Second, I want to make clear that my predictions are not my votes. We are all biased by our views and I'm no different, but I try to make predictions on what I think will happen, not on what I want to happen. Let's start with City Council. Let's review the rules of the game. In the primary, which is on April 2nd (early voting tomorrow at city hall). Each citizen gets two votes and if any candidate gets over 50% of the voters to put them as one of their choices, they get in and no general election is required for them. If no candidate gets over 50% than the top 4 candidates face off in the general election for the two available seats. So, the eight candidates running are Peggy Leavitt, Rich Shuman, Tom Tyler, Trenton Motley, Brent Foutz, Judy Dechaine, Claudia Bridges and James Howard Adams. Prediction #1- No candidate will get through in the primary. There are far too many people on the ballot, all of which have connections in the community and will pull a decent amount of votes so we will be onto the general. Prediction #2-Sorry Trent and Brent, but you two will get the least amounts of votes. I do not wish to be negative about either of these candidates, but I have not seen one sign, mailer or Facebook post promoting them. In fact, I have hardly heard of them, and I don't think I am alone. People need to feel like their candidate has a chance and really wants this to put their vote for their name, and these two haven't convinced the public they are serious candidates. Prediction #3- Peggy Leavitt and Rich Shuman will make it to the general election. Had I written this prediction a week ago, I might have not given Rich Shuman as much chance. He seemed MIA, as far as marketing his campaign, but he has showed up and will get past this first round. Incumbents by nature have some natural advantages, and disadvantages. But the advantages are sufficient to ensure that they will both be on the general election ballot. I will even go so far as to guess they will both be in the top 3, mostly because the anti-incumbent vote will be very split with the remaining candidates. Prediction #4- Tom Tyler will not make it to the general election. 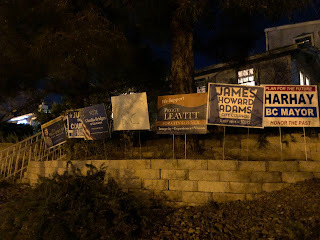 I know Tom and he is a wonderful man, has good connections in town and through the Emergency Aid of Boulder City but he has not been as involved in city politics and doesn't have a natural base. This will prove too much for him to overcome. Prediction #5- James Howard Adams will make it to the general election. James has been involved in BC politics for sometime. The endorsement of the Boulder City Community Alliance (BCCA) was big for him and he has proven worthy of the endorsement. He has really out performed expectations . I think he will be in the top three. Prediction #6- This is where I would get in toss-up territory. I had a very difficult time guessing who I would list as the #4 slot in the general election, Judy Dechaine or Claudia Bridges. Claudia got the endorsement of the BCCA, which is big. But even those in their own ranks questioned if the process was above board. Last year, they had a candidates forum with all the candidates and after they had heard all their viewpoints voted as a group on who to endorse. This time, the BCCA founders met separately with people they wanted to run, had them present at a meeting and choose to endorse before candidate filling had even ended. This left for an awkward position for people like Judy. Judy is very connected and involved with BCCA and their causes, but the endorsement went to Claudia before she had even filed. But despite this, I think Judy has been a surprisingly good candidate, and pulled much of the BCCA base to her side. She has been more engaged than Claudia and I think she will get the #4 spot and Claudia will be in #5. Now onto the Mayor. Back when I wrote for the paper I encouraged both Rod Woodbury and Warren Harhay to run (you can read the articles here. Woodbury Harhay.) I am very excited to see them both running. And I think all three candidates are good options, which has made this hard to predict. Prediction #7- No one will get 50% of the vote and win in the primary. All three of these candidates are good viable candidates and they will split the vote enough that no one will get above 50%. I will digress a little bit to tackle an incorrect idea that I have seen a lot of. I have seen those who are opposed to Mayor Woodbury disparage either Harhay or McManus for both running and splitting the anti-Woodbury vote. This is crazy, and shows some basic misunderstanding of how our primary/general election works. They can't split the vote because which-ever one gets more of the votes will go head to head with Woodbury. In fact, both of them running actually hurt the Mayor. If he had only one to run against in the primary, when voting is more limited, he would be more likely to take over 50% and not even need to run in the general. (I think of the two electorates, the general election and primary, the primary is more favorable to Woodbury). Prediction #8- Mayor Woodbury will get the most votes in the primary. Until recently I really felt the Mayor was in serious trouble (and he may still be in the general). But he has used his strengths, good connections, and a well financed campaign to his advantage. I think with others on the ballot splitting the anti-incumbent vote he will get the most votes. Prediction #9- This one is hard for me to write, and while I have tried to be neutral as I write this, I hope I am wrong. But, Warren Harhay will not be going onto the general election. He is the moderate, middle of the road candidate, and the middle is a tough place to win primaries from. And while I applaud his self funded candidacy, it has hurt him. Signs and mailers are not everything, but they are something and that is how some people will be introduced to candidates. What is so funny about this is that I think Harhay could potentially win against either of the other two candidates in a head to head. Why? because most people who vote for Woodbury in the primary would rather have Harhay than McManus, and most people who vote for McManus would rather have Harhay than Woodbury. So, you could see a 35% for Woodbury, 35% for McManus, and 30% for Harhay. But head to head Harhay would potentially beat both 60/40. But those are the rules, and so that is how it goes. So in the end, I think it will be McManus and Woodbury in the general election. As always, if you think I am crazy. Get out, vote and prove me wrong.